Enjoy an expedition into your senses with Marisa Hallsted, Certified Sommelier, Yoga, Meditation and Mindfulness Teacher. 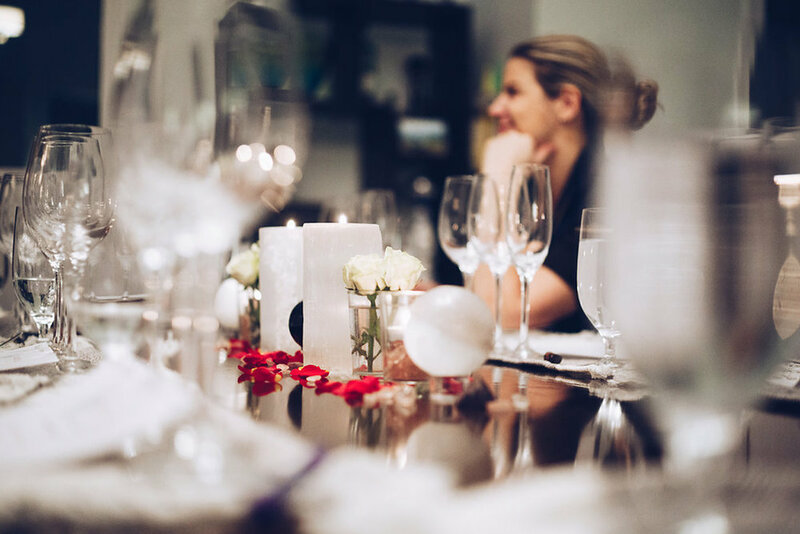 You will be led through techniques that transform a luxury sommelier and private chef curated wine and food tasting into a fully immersed experience, we come to you! The journey will guide you through a unique dining format combining mindfulness, connected conversation and self-discovery that transforms life beyond the table. Together, we will explore and awaken our palates to the pleasure of the moment. The Mindful Vine offers mindfulness, team connection and leadership workshops that inspire innovation. A perfect way to host your tribe in luxury in a way they have never experienced before. Offer ‘A Journey of Your Senses’ dining experience for your group and immerse them even more fully into the moment. For more information about events, click here. Curating immersive experiences that engage the senses and please the palette. Not only will you become educated from food and wine experts, you will also learn breath and body awareness techniques that increase joy and vitality beyond the table. Awaken your senses and live fully in every moment. Have you ever wondered why right now is called the present? It's because it is the greatest gift you will ever receive. The Mindful Vine awakens your senses and gives you the tools to live fully in every moment.